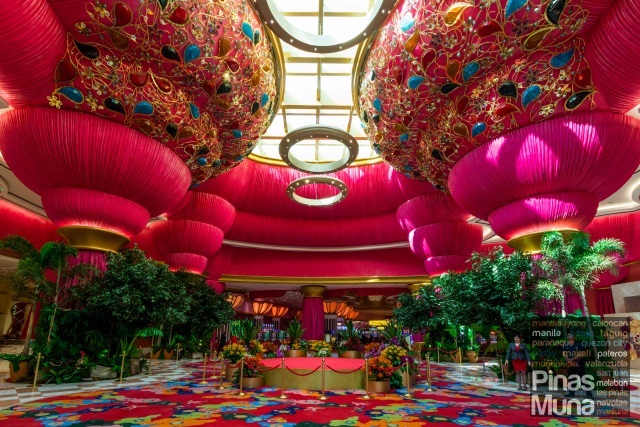 Okada Manila (オカダマニラ) debuted in March 2017 as the largest integrated resort in the Philippines. 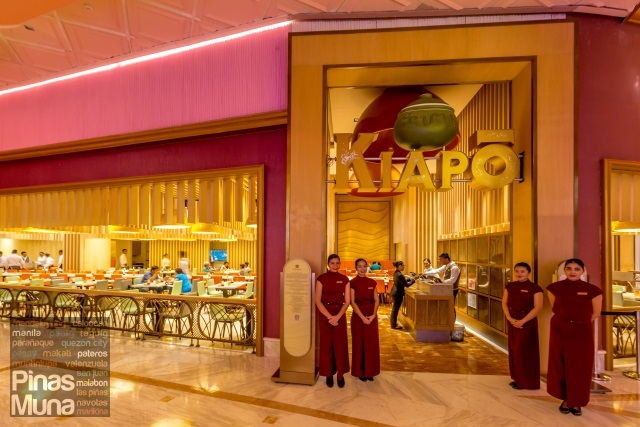 Located in the Entertainment City Complex of Parañaque City (Metro Manila, Philippines), Okada Manila consists of a 993-room luxury hotel, a casino, a retail and dining strip, and an in-door beach club which is the biggest of its kind in the Southeast Asia. 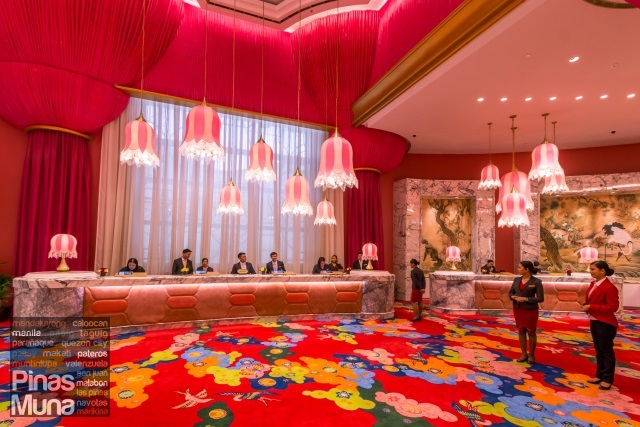 With its bold architecture, over-the-top design, and world-class hospitality, Okada Manila aims to put Manila in the global map of gaming and entertainment destinations. Located only three kilometers away from the Ninoy Aquino International Airport, guests enjoy easy accessibility to the airport via the newly opened NAIA Expressway. Regardless of your choice of transportation, it will only take 10-15 minutes to get from the airport to Okada Manila. 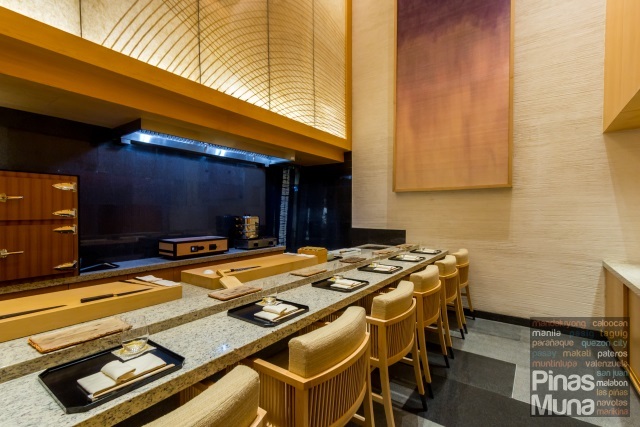 A couple of weeks ago, we enjoyed a weekend staycation at Okada Manila. We stayed in one of the hotel's spacious Deluxe Room. 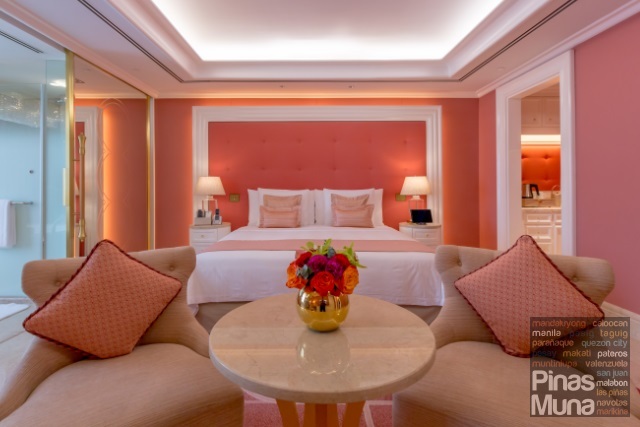 At 60 square meters, the Deluxe Room at Okada Manila is currently the most spacious deluxe room in Manila. 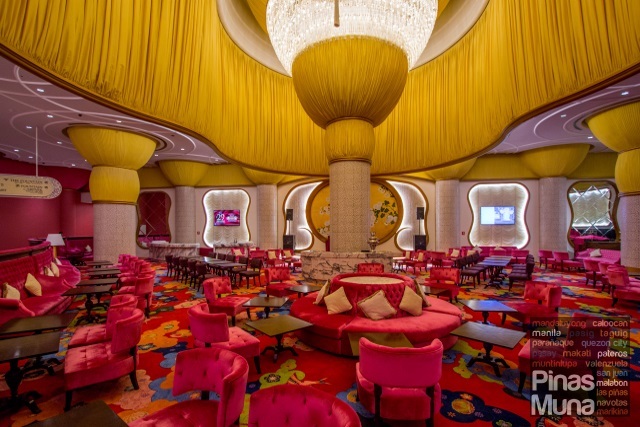 The room is dominated by hues of pink, beige and gold, reminiscent of the colors of the sakura flower. The room is bathed with plenty of natural light coming in through the floor-to-ceiling glass window, giving the space an airy feel. The sleeping area is furnished with a king size bed with two bedside tables. A seating area is located at the foot of the bed and functions as the living area of the room. There's also an executive writing desk next to the seating area. There's plenty of space for two persons to comfortably move around the room. The Deluxe Room has a spacious walk-in closet which houses a luggage rack and an open shelf wardrobe with wooden clothes hangers. Laundry bags and bath robes are also stored in the closet. The walk-in closet connects the room's foyer and a small pantry. 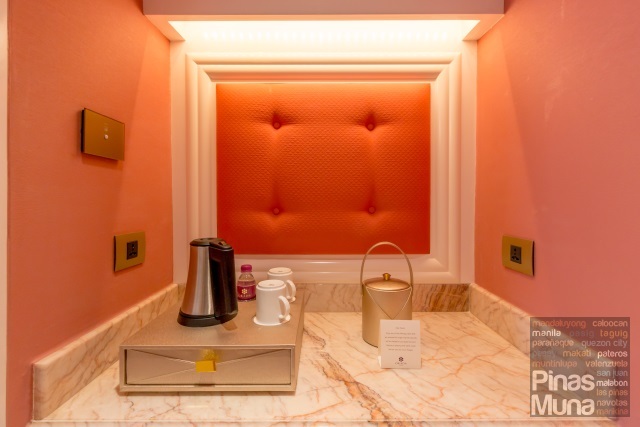 A minibar, a coffee and tea making facility and complimentary bottled water are provided. 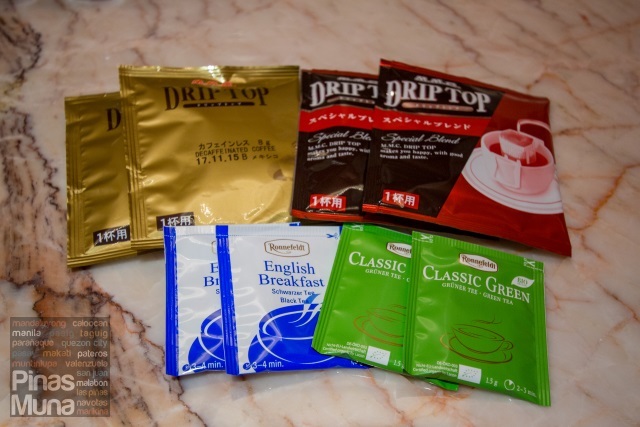 Part of the complimentary in-room amenities are the Ronnefeldt tea bags and the pour-over Drip-Top coffee pouches, adding more Japanese touch to the stay experience. 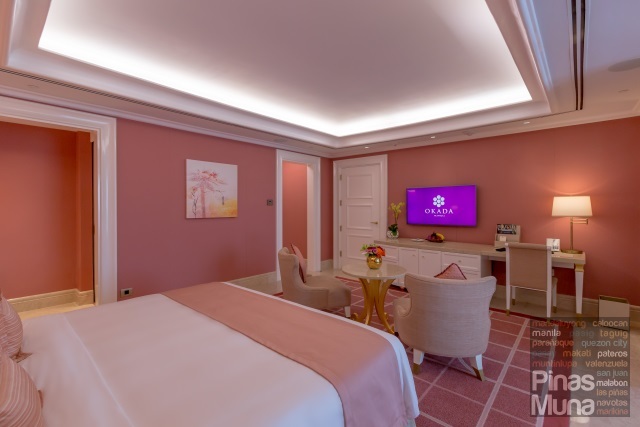 Another unique feature of Okada Manila are the state-of-the-art Digivalet Service which is an in-room iPad that serves as the control panel for the in-room amenities such as the lighting, the air-conditioning, and the television. It also allows the guests to check their outstanding hotel bill. 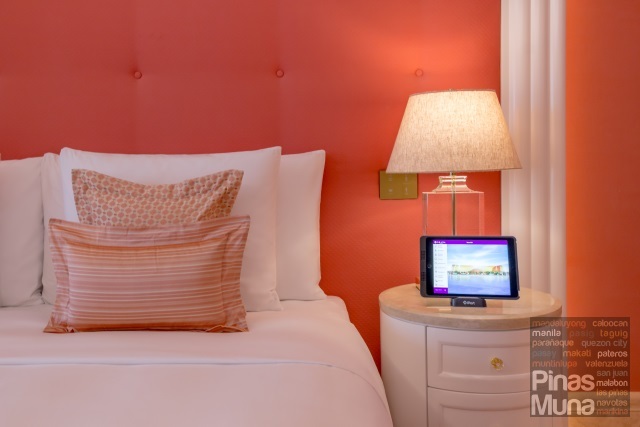 Complimentary wired and Wi-Fi internet connection are available inside the room. The flatscreen television is loaded with satellite and HDTV channels. You can also stream Youtube videos on the television via the Digivalet tablet. 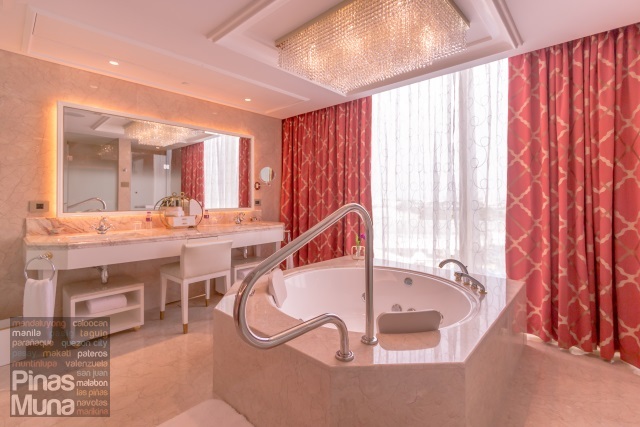 Opening the glass sliding door will lead to the marble bathroom fitted with a spacious vanity, a private Jacuzzi and separate walk-in shower and water closet. 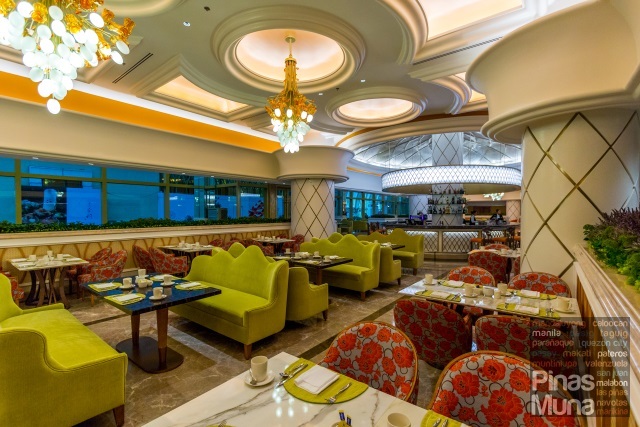 In addition to the sweeping view of the city, the chandelier also adds an elevated sense of luxury. 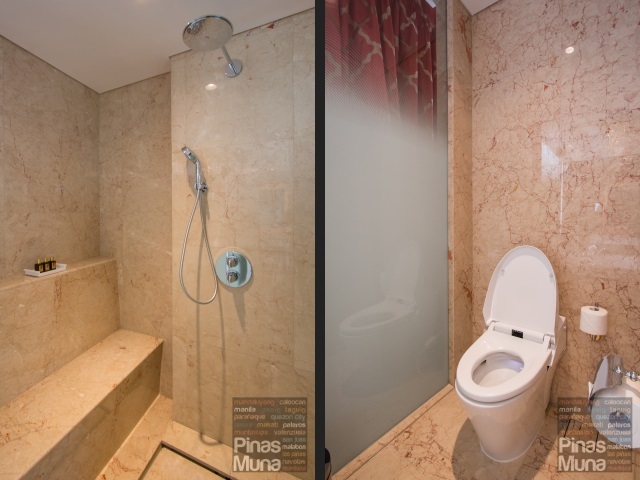 The walk-in shower is fitted with a rainfall and handheld showerhead with hot and cold water flowing in high pressure. The shower seat gives extra comfort to your shower experience. High quality towels are also provided. The water closet is equipped with a Japanese toilet with automatic motion-sensor cover and warm-water cleaning toilet seat which is controlled by a wireless toilet control panel. 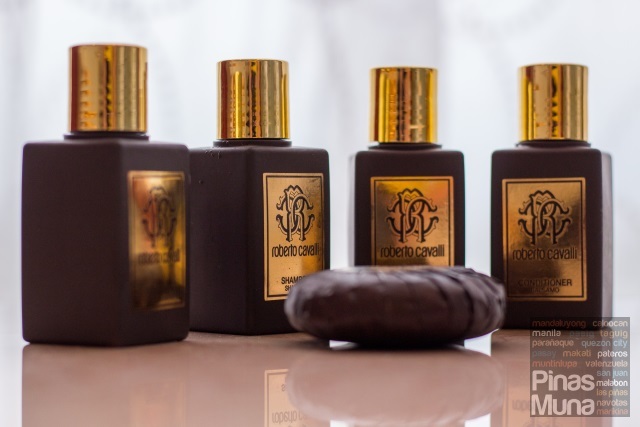 Okada Manila partnered with Roberto Cavalli who designed the fragrance for the hotel's body and bath amenities. The collection includes shower gel, shampoo, conditioner, hand soap and body lotion. The Roberto Cavalli toiletries at Okada Manila are now part of my personal favorites and will be one of my main motivations of staying at Okada Manila again. 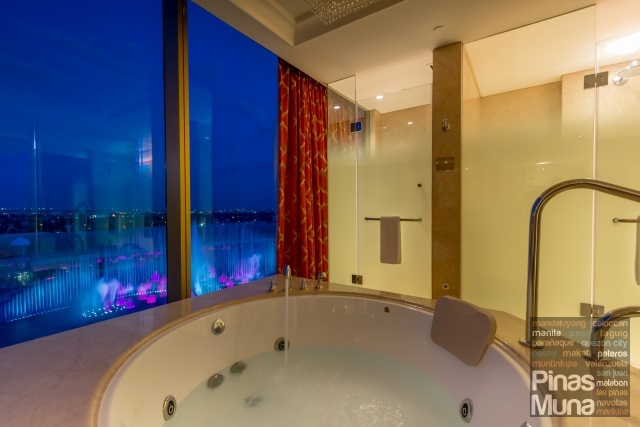 The highlight of the bathroom has got to be the private Jacuzzi which is equipped with a bubble jet system. It is big enough to fit two persons. Hot and cold water are available so you can easily control the temperature of your bath. During my stay, I was able to enjoy a warm bath while watching the dancing water fountain show. The Fountain is one of the key attractions of Okada Manila. It is currently the world's biggest multicolored dancing water fountain which is a product of state-of-the-art technology that creates accurately choreographed water, light and music performances that can match or even rival The Dubai Fountain of Burj Khalifa and the Fountains of Bellagio in Las Vegas. The Fountain is open to the public with shows scheduled daily from 6:00pm to 10:00pm with two back-to-back songs at the top of each hour (on Fridays and Saturdays, the last show is at 12:00mn). 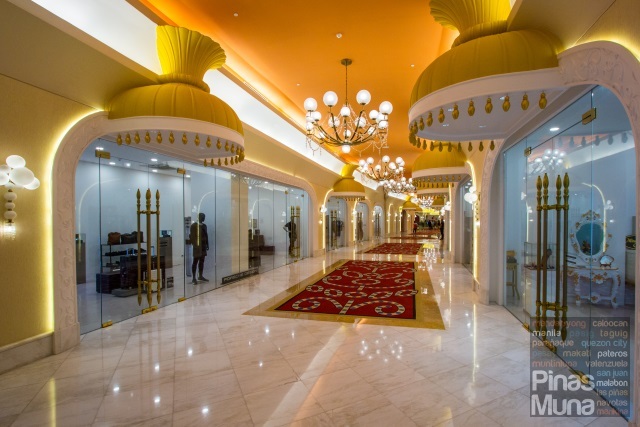 The Okada Manila integrated resort complex also houses the Crystal Corridor which features a wide range of luxury brands and premium fashion brands and other lifestyle shops. Surrounding The Fountain is the Retail Boulevard which will host more boutique shops once fully operational. 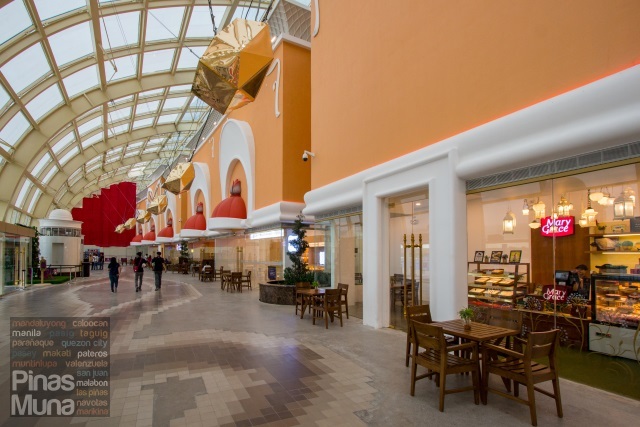 Guests can also enjoy some of the pop-up restaurants located at the Retail Boulevard. 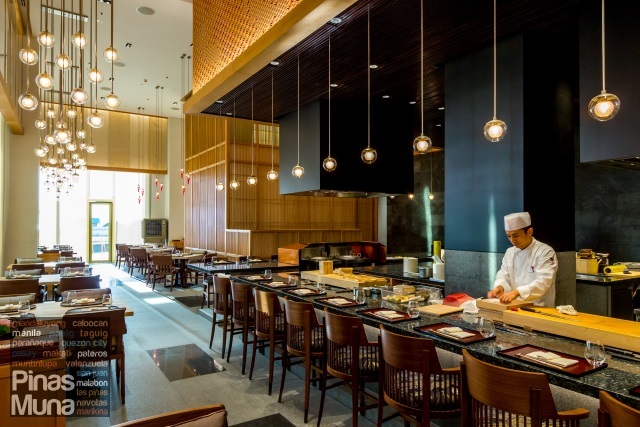 An overnight stay at Okada Manila comes with complimentary buffet breakfast for two persons at Medley Buffet. 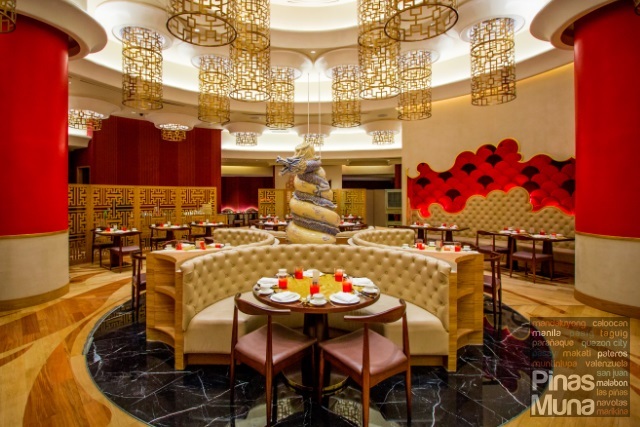 Located on the ground floor of the hotel, Medley Buffet features a wide selection of local and international cuisines, with strong focus on Asian cuisine. 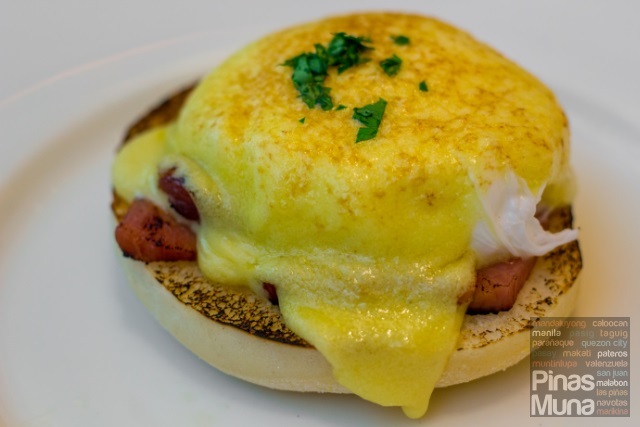 Western dishes include continental items as well as pastries, vienoisserie, charcuterie and classic American breakfast fare such as bacon, ham, sausages, and hash brown. There's also an egg station where you can have eggs cooked to your preference. I recommend their eggs benedict. 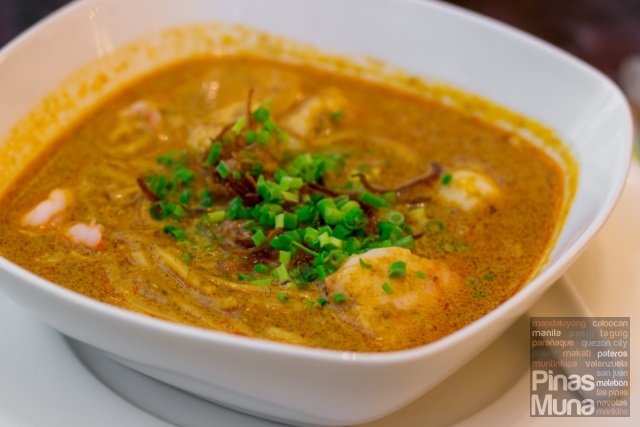 The buffet also has a noodles station where you can find one of the most authentic tasting Singaporean laksa in Manila. The broth was thick and full of flavor and the dish served with generous amount of prawns. 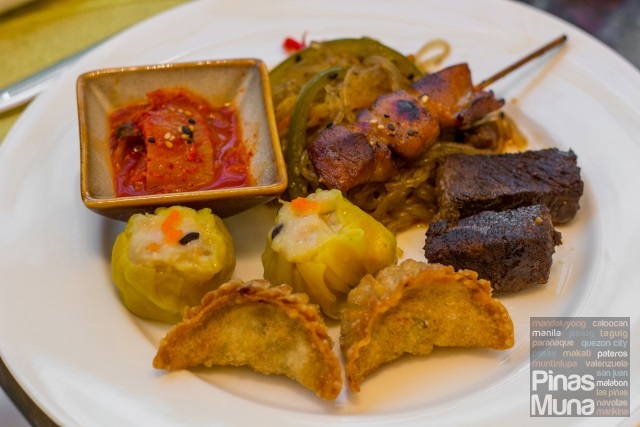 There are separate sections for Indian, Chinese, Korean, Japanese and Filipino dishes with choices that include both breakfast and lunch items. 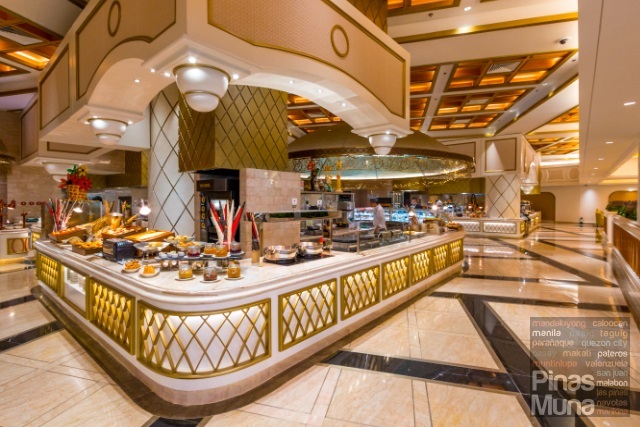 So whether you prefer early breakfast or early lunch, the buffet has got you covered. 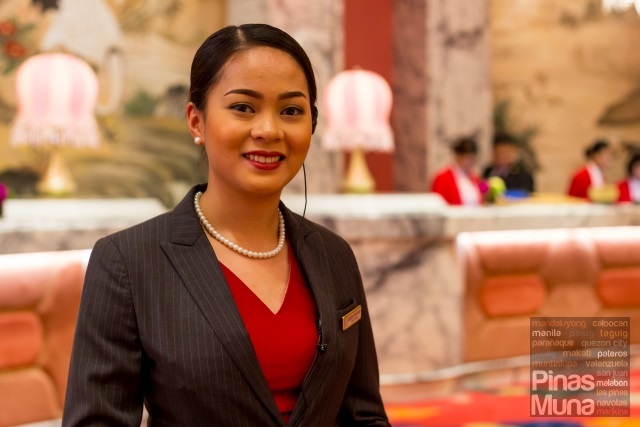 Making your stay at Okada Manila extra special is the world-class customer service of the hotel staff. 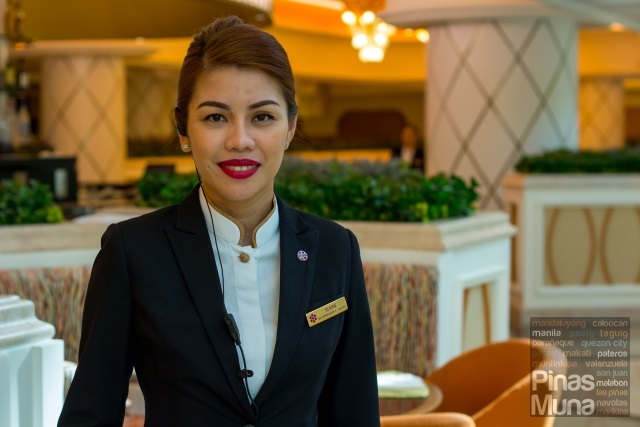 The hotel hired some of the best hoteliers in the country including Filipinos working as hoteliers abroad. What I appreciate the most was their strong sense of anticipation of need. 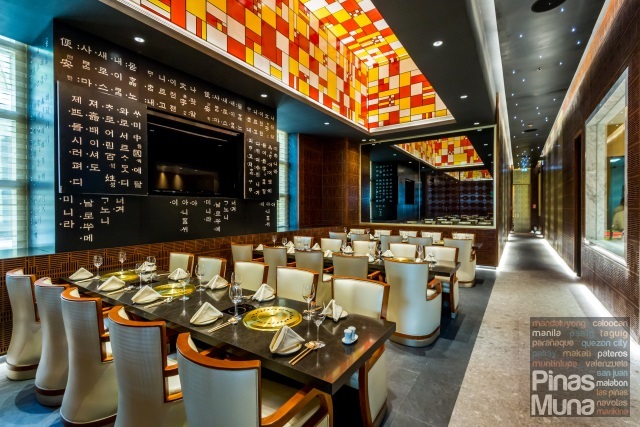 Okada Manila for me is a luxury hotel brand with the charm of Japanese elegance and the warmth of Filipino hospitality. 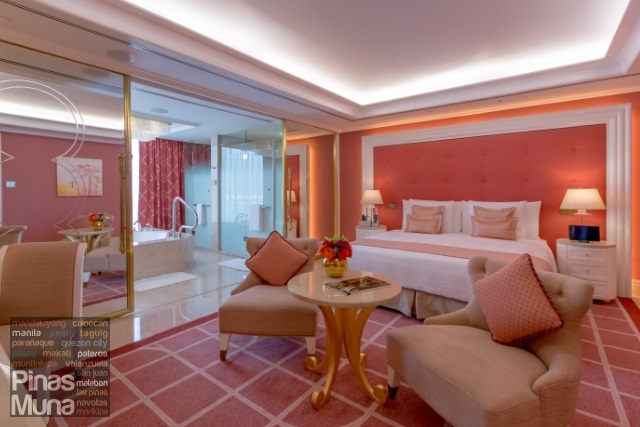 Okada Manila is indeed a welcome addition to the growing number of hotels in Metro Manila with it own unique identity coupled with the signature attentive and caring Filipino customer service.